White ramp... that doesn’t feel like a color pie breach. Stop the gosh-darned presses! An interesting take on things like Underworld Dreams, I like it. Stupid Combo Time; This, Otherworld Atlas (2 counters,) and Clock of Omens. And a tapped out opponent. I actually like this with a lot of the wheel effects. Follow this with a reforge the soul, Time reversal, burning inquiry, fascination, finish them off with a cerebral vortex? I can't wait to drive myself insane trying to catch all the triggers of this in an EDH game. I expect our local Grand Arbiter IV player will find a place for it. Yeah, this feels like a card that would work better in paper if it had 'may create...' to avoid accidental rule violations, but that "may" would double the number of clicks for online versions. 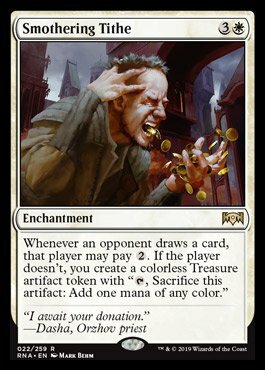 Treasure tokens outside of Ixalan, that's unexpected. This is going in all my white decks. Good, but somehow balanced. I’m not sure where it will find a home, but surely it will.